Acute Pericarditis is a well-recognised cause of chest pain. Patients with pericarditis are seen commonly in the Emergency Department (ED): it is reported that 5% of patients presenting to the ED with non-ischaemic chest pain have acute pericarditis . It is therefore a condition that Emergency Physicians should be familiar with. 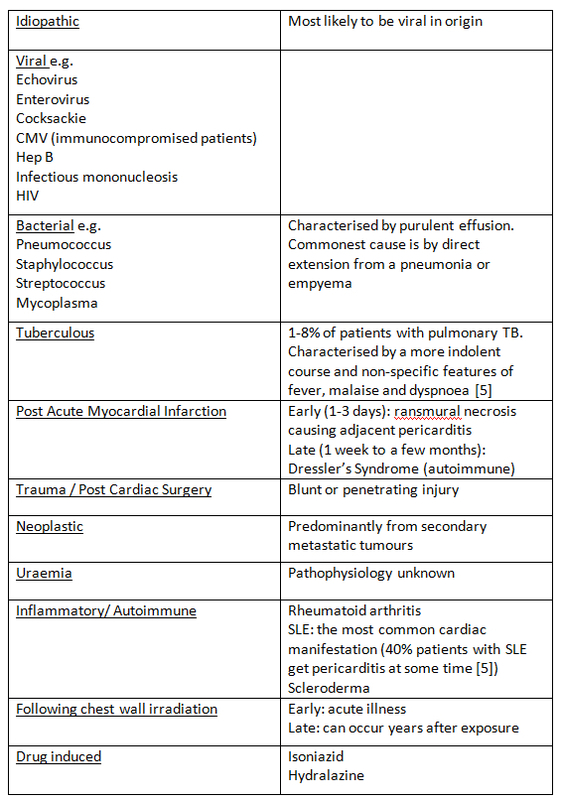 The causes of acute pericarditis are widespread and are listed in Table 1. Most cases are “idiopathic” (80-90%) . Although labelled as idiopathic, the majority of these are likely to be viral in origin, but viral testing is not routinely done as it rarely alters the management and is not cost-effective. The incidence of viral pericarditis is higher in young previously healthy adults and is lower in those patients who are subsequently found to need inpatient management. Patients with tuberculous pericarditis present with a less acute course. Patients with bacterial pericarditis present more acutely unwell and with other features of bacterial sepsis. Most cases of acute pericarditis in developed countries are based on viral infections which are self-limiting, with most patient recovering without complications. The pericardium is composed of 2 layers: (i) the outer thicker fibrous pericardium and (ii) the inner visceral or serosal pericardium which is made up of a thin layer of mesothelial cells. In a normal physiological state the pericardial sac between these 2 layers contains 15-50mls of fluid. The combined thickness of these 2 layers should measure less than 2mm . Pericarditis is caused by inflammation of the pericardial layers associated with varying amounts of pericardial fluid collection which may result in a significant pericardial effusion. The clinical presentation is usually one of acute onset of chest pain; classically this is pleuritic in nature and eased by sitting up and leaning forward. The pain may be anywhere over the anterior chest wall, but it is usually retrosternal. It may radiate to the arm like ischaemic pain. A characteristic feature of the pain which is specific for pericarditis is radiation to the trapezius ridge ; the phrenic nerve traverses the pericardium and also innervates this muscle. Pericardial friction rub has been reported in around a third of cases . This rub is often dynamic so repeated examination may be useful if it is not heard at the outset. It is heard maximally during expiration and is loudest at the lower left sternal edge. It can be distinguished from a pleural rub by the fact that it will still be heard when the patient holds their breath. A temperature over 38 degrees centigrade is a high risk feature for pericarditis. It may be associated with the presence of a bacterial infection (eg. a coexistent pneumonia). HIV is associated with acute pericarditis in a number of ways. It can cause a direct infective pericarditis or pericarditis can be associated with other opportunistic infections such as CMV. Kaposi’s sarcoma and lymphoma can cause a non-infective pericarditis. Patients with the cutaneous or musculoskeletal features of rheumatoid arthritis, SLE and systemic sclerosis may be at risk of acute pericarditis relating to these diseases. This can occur early (within days) or late (months). Patients with a raised urea may have non-specific features of nausea, vomiting, anorexia and itching. Pericarditis may occur in association with chronic or acute kidney injury. The classic triad of distended neck veins, muffled heart sounds and hypotension (Beck’s triad) may not be present. Patients can have an insidious onset of tamponade and the symptoms and signs may be very non-specific. They may have orthopnoea, dysphagia, cough and occasionally episodes of loss of conciousness . Echocardiography is required in all cases of suspected pericarditis in order to complete risk stratification (see below). Patients may give a history of previous resolved episodes of chest pain, or of ongoing chest pain which has required a prolonged course of NSAIDs. This is defined as pericarditis lasting for more than 3 months. Symptoms include chest pain, palpitations and fatigue. In order to appropriately risk stratify a patient with pericarditis, the emergency physician needs to consider the possible aetiology of the pericarditis along with the presence of high risk features. These high risk features (see Table below) are associated with a poorer prognosis and may help guide the need for inpatient management . Failure to respond to aspirin/non-steroidal anti-inflammatory drug (NSAID) therapy. The presence of any high risk feature is associated with a poorer prognosis. These patients should be admitted for inpatient management. To help establish the diagnosis and look for high risk features a number of simple investigations should be performed within the ED. As well as looking for the characteristic features of pericarditis on the ECG it will also help to distinguish other potential causes of chest pain. 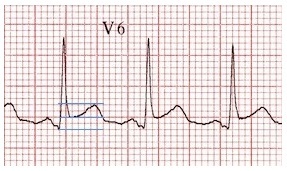 Stage 4 is represented by normalisation of the ECG or indefinite persistence of T wave inversions. 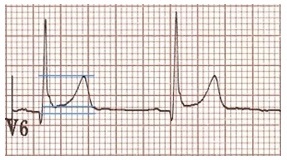 Fig 1 demonstrates the acute phase and demonstrates the ECG findings likely to be seen in the ED. 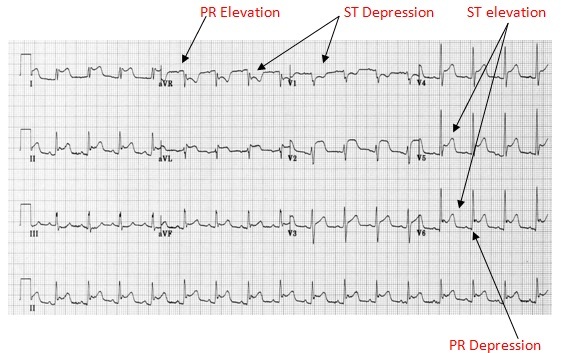 The above ECG changes are seen in the acute phase of pericarditis and are likely to be seen within the ED. As the disease progresses so may the ECG: there may be notched T waves, biphasic T waves or T wave inversion. These T wave changes may last for weeks or months but are of no clinical significance if the patient has recovered clinically. Dysrhythmias are uncommon in pericarditis and if present may indicate myocardial involvement (Myopericarditis). The ECG changes seen in pericarditis can be confused with Benign Early Repolarisation (BER). The most reliable ECG distinguishing feature is seen in lead V6. Specifically, when the ST elevation (mm) to T wave height (mm) ratio is greater than 0.25 acute pericarditis is more likely than BER (Figs 2 and 3) . Troponin levels may be measured and are raised in 30-70% of patients with acute pericarditis. This does not offer any prognostic information . A troponin rise is partially related to the extent of coexisting myocardial inflammation but, unlike in acute coronary syndromes, elevation in troponin is not associated with adverse outcome in pericarditis . However, if the troponin is raised the patient should be considered to have myopericarditis and as this is a feature of poor prognosis further inpatient workup should be considered. A full blood count should be performed looking for an increase in the white cell count (WCC). A mild lymphocytosis is common. Significantly raised WCC is an indicator of poor prognosis and will therefore make inpatient management more likely. CXR is generally performed to look for alternative causes of chest pain. There may be radiological features of pneumonia if bacterial pericarditis is suspected or mass lesions indicative of neoplastic disease. CT of the chest may be performed to look for alternative diagnoses such as acute aortic dissection or pulmonary embolism. Acute pericarditis may be accompanied by some myocardial involvement. Once the diagnosis of acute pericarditis has been made one should consider whether there is any myocardial involvement. Troponin cannot be used to discriminate alone , however new onset of focal or depressed LV function on echocardiography would indicate inflammatory involvement and damage to the myocardium. A diagnosis of myopericarditis requires full clinical assessment including ECG, troponin and Echocardiography. Although Troponin levels are elevated in 30-70% of patients with pericarditis, and alone they offer poor prognostic information, the presence will warrant further assessment to exclude myopericarditis. In absence of high risk features these patients can be managed in the community. Patients should be instructed to restrict strenuous physical activity until symptoms have resolved and biomarkers have normalized. Athletes should be advised not to compete in competitive sports for at least 3 months following resolution. Any obvious underlying cause for acute pericarditis should be treated (eg. pneumonia, tuberculosis, uraemia, etc.). NSAIDS are the mainstay of treatment for pericarditis (e.g. aspirin, ibuprofen, indomethacin, etc.). Aspirin is used preferentially if pericarditis is a complication of acute myocardial infarction. It has been recommended that NASIDS can be stopped after resolution of symptoms but colchicine should be continued for 3 months. Patients who fail to respond to initial treatment within 1-2 weeks should be admitted to hospital for further assessment. Steroids are not indicated for acute pericarditis in the early phase as they are associated with an increased risk of relapsing pericarditis. Steroids should only be considered as first line treatment when the underlying cause is thought to be immune-mediated, due to a connective tissue disorder, or in uraemic pericarditis . First line drug treatment for uncomplicated acute idiopathic pericarditis is NSAIDs and colchicine. Studies evaluating the aetiology of acute pericarditis reported that a specific cause was found in 17% of patients and that most complications were seen in these patients . Complications included acute cardiac tamponade (3.1%) and chronic constrictive pericarditis (1.5%). Purulent pericarditis associated with tamponade is potentially fatal and requires urgent drainage and intravenous antibiotics; it carries a mortality rate of 40%. Relapsing pericarditis occurs in 15-30% of patients with a presumed idiopathic aetiology, a small proportion of whom go on to suffer chronic relapsing pain. The main pitfall for the emergency physician is not carrying out a full risk stratification (including an echocardiogram) before declaring the patient suitable for discharge. Misselt AJ et al. MR Imaging of the pericardium. Magn Reson Imaging Clin N Am 2008;16:185-199. Fruergaard P, Launbjerg J et al. The diagnoses of patients admitted with acute chest pain but without myocardial infarction. Eur Heart J 1996;17. Le Winter M, Tischler M. Pericardial Diseases. In Bonow: Braunwalds Heart Disease A Textbook of Cardiovascular Medicine, 9th ed. Chapter 75. Khandaker MH et al: Pericardial diseases; diagnosis and management. Mayo Clin Proc 2010;85(6):572-593. Lange RA, Hills D. Acute pericarditis. N Engl J Med 2004;351:2195-2202. Ginzon LE Laks MM. The differential diagnosis of acute pericarditis from the normal variant; new electrocardiographic criteria. Circulation 1982;65:1004-1009. Body R, Ferguson C. Should we be measuring troponins in patients with acute pericarditis? Emerg Med J 2008;25:253-524. Imazio M, Cecchi E, Demichelis B et al. Indicators of poor prognosis of acute pericarditis. Circulation 2007;115:2739. Eppert A, Baombe J. Colchicine as an adjunct to non steroidal anti-inflammatory drugs for the treatment of acute pericarditis. Emerg Med J 2011:244-245. Imazio M, Cecchi E et al. Day hospital treatment of acute pericarditis. J Am Coll Cardiol 2004;43:1042-1046. Imazio M, Trinchero R. Triage and management of acute pericarditis. International Journal of Cardiology 2007;118:286-294. Useful article detailing the key learning points regarding pericarditis throughout.